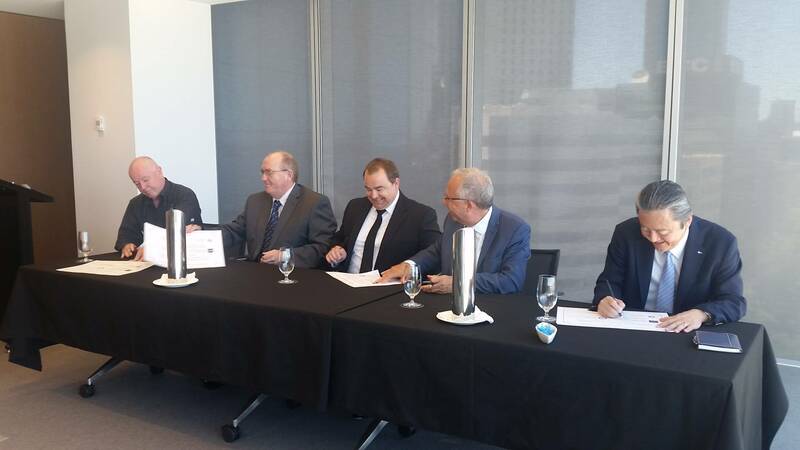 On 24th January 2017 in Perth AIMPE, AMOU and MUA representatives gathered with Inpex representatives for the ceremonial signing of the arrangements agreed in late 2016 to cover the maritime aspects of the Ichthys Project. Pictured are the five signatories from left to right: Chris Cain [President MUA], Terry Snee [President AIMPE], Tim Higgs [President AMOU] Hitoshi Okawu [Director, Inpex] and Louis Bon [Managing Director, Ichthys Project]. What is the Inpex Agreement? INPEX, the developer and operator of the large-scale Ichthys LNG Project, has signed an arrangement with Australia’s three maritime unions covering the next decade of operations. Included in the arrangement are commitments towards the training of maritime employees, the implementation of a diversity program, and the promotion of Australian crews on Project support vessels (to the extent practicable and permissible by law). These commitments are aimed at retaining and enhancing the skills and experience of Australian maritime workers in the LNG sector. A key feature of the arrangement is an enhanced dispute settlement process, which creates a proactive framework for the settling of disputes, and will have in place a dedicated conciliator for that purpose. The arrangement also seeks to provide certainty of operations through the dispute settlement scheme. The focus of the dispute settlement process is on conciliation as the primary method for resolving disputes. The process facilitates discussions between the parties to a dispute in an effort to resolve matters constructively and expeditiously. The arrangement is consistent with, and reflects, the intent of the Fair Work Act, in that it supports and promotes cooperative and productive workplace relations that will proactively prevent disputes. (a) The parties are committed to fostering a solution-based work environment, underpinned by mutual respect and desired behaviours by all parties. (b) INPEX encourages and supports employers and prospective employers of maritime employees on the Project to implement safe workplace programs and frameworks, and high standards of HR/IR practices. (c) The maritime unions recognise the importance of proactive communication and constructive engagement with all employers of maritime employees on the Project. The arrangement has been negotiated by the parties with a framework that will have it in place until 2030.